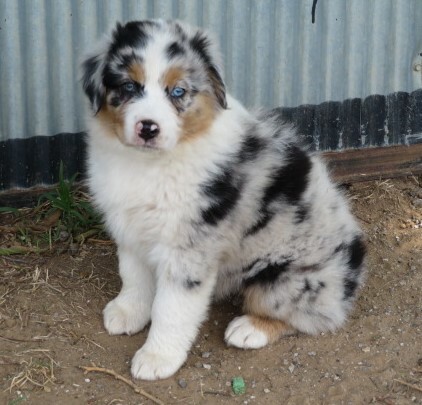 There are 4 acceptable colors in the Australian Shepherd breed pictured below. Blue Merle, Black, Red Merle, & Red all with or without white and/or copper trim. Breeding merle to merle is unacceptable as each puppy has a chance of being born blind & deaf as a result. Breeding tri to tri produces all tri's therefore, the preferred color crosses are blue merle to black tri, blue merle to red tri, red merle to black tri, & red merle to red tri. In addition, red to red yields all reds so breeding a red merle to a red tri produces ONLY red merle & red tri puppies. And since tri to tri yields all tri's, breeding red tri to red tri yields all red tri's. To produce red puppies, either red tri or red merle, BOTH parents must be red factored, not red in color, but one that carries a red gene. For instance, breeding a red factored blue merle to a red factored black tri yields the probability of 2 red tri, 2 red merle, 2 blue merle, & 2 black tri if there are 8 puppies in the litter. However, mother nature usually has other ideas so any color combination is possible such as 3 blue, 3 black, 2 red either tri or merle or any other color combination. We have also whelped a litter of 10 puppies from 2 parents that are both red factored & produced all blue merle & black tri's, NO red's. In a breeding where one parent is red, such as blue merle to red tri or red merle to black tri, we typically get more red's in the litter such as 3 red merle, 3 red tri, 1 black tri, & 1 blue merle. In a breeding where one parent is NOT red factored, the litter will only produce blue merle & black tri as, again, BOTH parents must be red factored to produce red puppies. For instance breeding a blue merle that is not red factored to a black tri that is red factored will yield only blue merle & black tri. Again, the probability is 4 blue merle, 4 black tri if there are 8 in the litter but this can go in any direction such as 7 black tri, 1 blue merle or 7 blue merle, 1 black tri. Also breeding a blue merle that is not red factored to a red tri or breeding a red merle to a black tri that is not red factored will only produce blue merle & black tri ... no red's. Furthermore, any puppy that has a red parent IS red factored as a red gene is all a red parent has to offer so even in litters where there are no red puppies, if one parent is red in color, ALL the puppies in the litter are red factored meaning they can produce red puppies when bred to a red or red factored mate. Puppies from a blue merle/black tri cross where one or both parents are red factored have a 50/50 chance of being red factored. Blue merle & black tri’s that are NOT red factored carry a black/black gene receiving a black gene from each parent. Blue merle & black tri’s that ARE red factored carry a black/red gene receiving a black gene from one parent & a red gene from the other parent. Red merle & red tri’s carry a red/red gene & ARE red factored. Because a red dog is a red/red & a red gene is all a red parent has to offer his or her puppies so any puppy with a red parent IS red factored. Blue merle and black tri puppies with a red factored blue merle parent AND a red factored black tri parent have a 50/50 chance of receiving the red gene from only one parent. Puppies in the litter who receive the red gene from BOTH of their parents in this color cross are in fact red in color because red dogs carry a red/red gene so the red puppies in the litter received a red gene from BOTH parents. Blue merle & black tri puppies from a red factored blue merle (black/red) & NON red factored black tri (black/black), or red factored black tri ( black/red) & non red factored blue merle (black/black), still have a 50/50 chance of receiving a red gene from the red factored parent but will receive a black gene from the non red factored parent making the puppy either black/black (NOT red factored) or black/red (red factored) on the gene scale. If the blue merle or black tri puppy is black/black, receiving the black gene from both parents, he/she is NOT red factored. 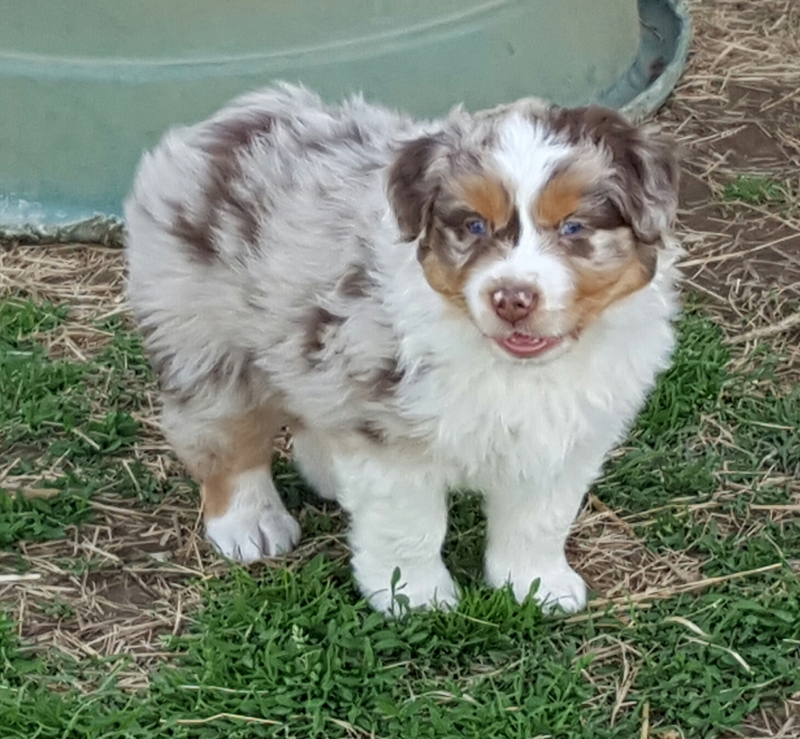 If the blue merle or black tri puppy is black/red he/she received the red gene from one parent & IS red factored & can produce red puppies when bred to a red or red factored mate. Copper trim is recessive. ALL of our dogs have copper trim so we only produce puppies with white AND copper trim. In a breeding where one parent has copper trim & one parent does not have copper trim, if there are 8 puppies in the litter, the probability is 4 puppies with copper trim & 4 puppies without copper trim. Again, mother nature usually has other ideas so you can have 2 puppies with copper trim & 6 without or vice versa or any other number combination. In a breeding where both parents have copper trim ALL the puppies in the litter will have copper trim. 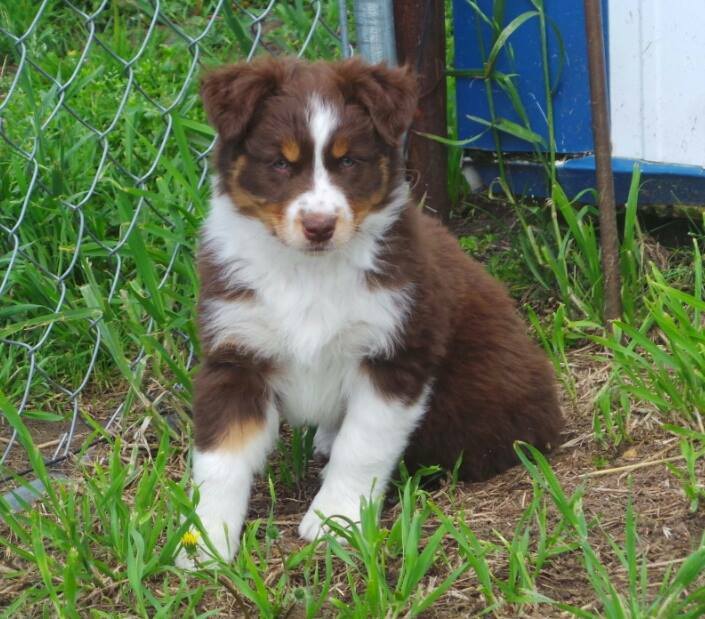 In a breeding where neither parent has copper trim, none of the puppies will have copper trim. A black & white puppy with no copper trim is a black bi. A red & white puppy with no copper trim is a red bi. The gene's from merle to merle crosses can be explained in much the same way as being red factored. 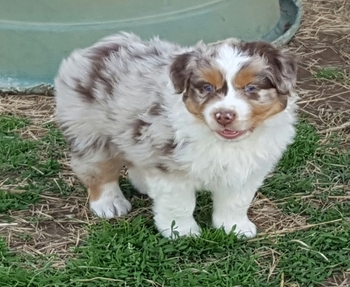 A merle colored dog, whether red merle or blue merle, has two genes, one merle gene & one tri gene or merle/tri, & WILL offer one gene to each puppy. A tri colored dog has two tri genes or tri/tri & WILL offer each puppy one gene. When breeding a merle to a tri the puppies that get a merle gene from the merle parent & tri gene from the tri parent are merle in color. The puppies that get a tri gene from the merle parent & a tri gene from the tri parent are tri colored. When breeding two tri's together the result is all tri's because both parents are tri/tri on the gene scale & only have tri genes to offer making all of the puppies tri's. The biggest myth is to breed two merle's together to get all merle's. If it were that easy everyone would do it. Again, the merle's are a merle/tri on the gene scale so when you breed merle to merle the puppies that get a merle gene from one parent & a tri gene from another parent are merle in color & merle/tri on the gene scale. Those puppies have no health issues. The puppies that get a tri gene from both merle parents are tri in color & are a tri/tri on the gene scale with no health issues. The puppies that get a merle gene from both merle parents are the merle puppies that are born blind & deaf & are usually white in color. So, again, the preferred breeding in Australian Shepherds is merle to tri to eliminate the possibility of having puppies born blind & deaf. Blue Merle with white & copper trim pictured above. Black with white & copper trim, also known as Black Tri, pictured above. Red Merle with white & copper trim pictured above. Red with white & copper trim, also known as Red Tri, pictured above.